October 16, 2015 9:12 pm / 14 Comments on Break out the lumber. 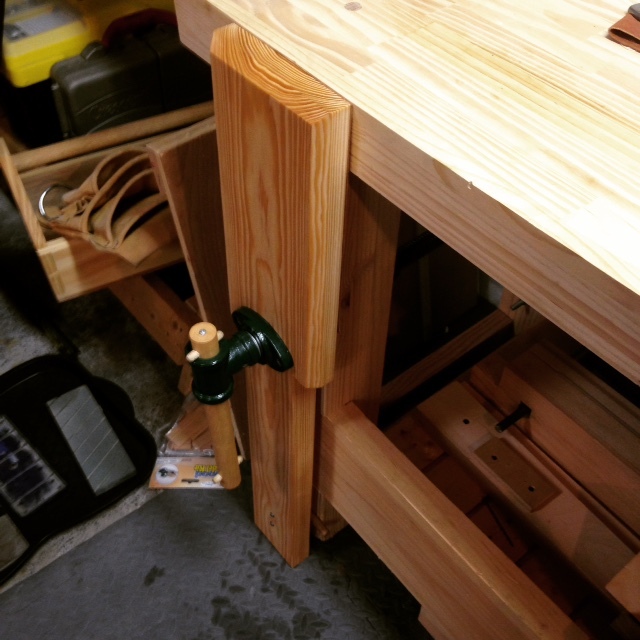 The other day a (non-woodworking) neighbor came into my garage while I was sharpening and commented on my workbench, in particular the new leg vise I just completed. He seemed fascinated by the fact that it was possible to make a vise, though I told him that I only made the chop and ordered the actual hardware; he was impressed nonetheless. But I think he was most impressed over the board I used for the chop itself, as he remarked over it several times. When I told him it was just a 2×10 from the Home Depot that I planed down and sanded, he wondered if I had ever made furniture from two-by lumber. I told him that I hadn’t, but it did get me to thinking. The truth is, I sort-of had made a piece of furniture from construction material. A few years back I built a plant stand using some (fir?) which originally had been a floor joist. It was rough sawn, and not fully dimensioned like two-by stock from a home center, but it was definitely construction lumber. I had no problems with the material, and it certainly worked easy enough, and because it was older, it had already dried. Though I didn’t really care in particular for that plant stand after the fact, the material was just fine. Cleaned up fir can look great. 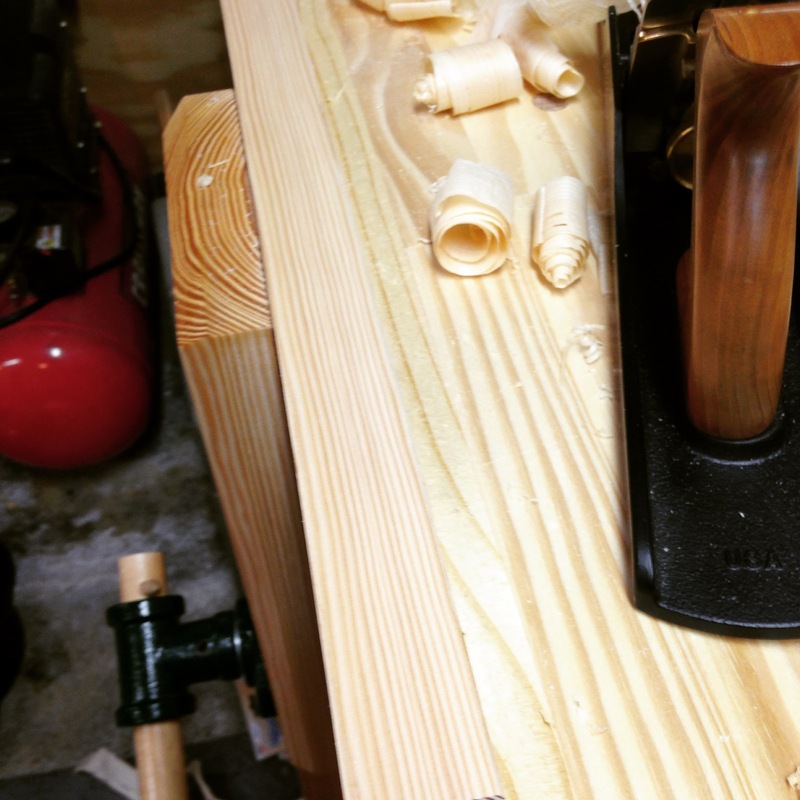 When I made the chop for my leg vise, I picked through the lumber rack at the Depot for about 5 minutes and selected 3 or 4 boards that looked the best. The board I chose was flattest, but any one of them would have likely worked, as they were all clear and had nice grain. In fact, had I chosen to do it, I could easily have ripped down (2) three-inch wide boards which were nearly quarter-sawn from several of those boards; perfect for making a very nice face frame. My point being I could have purchased four two-by’s for a very reasonable cost and with just a little effort turned them into some nice material for woodworking. 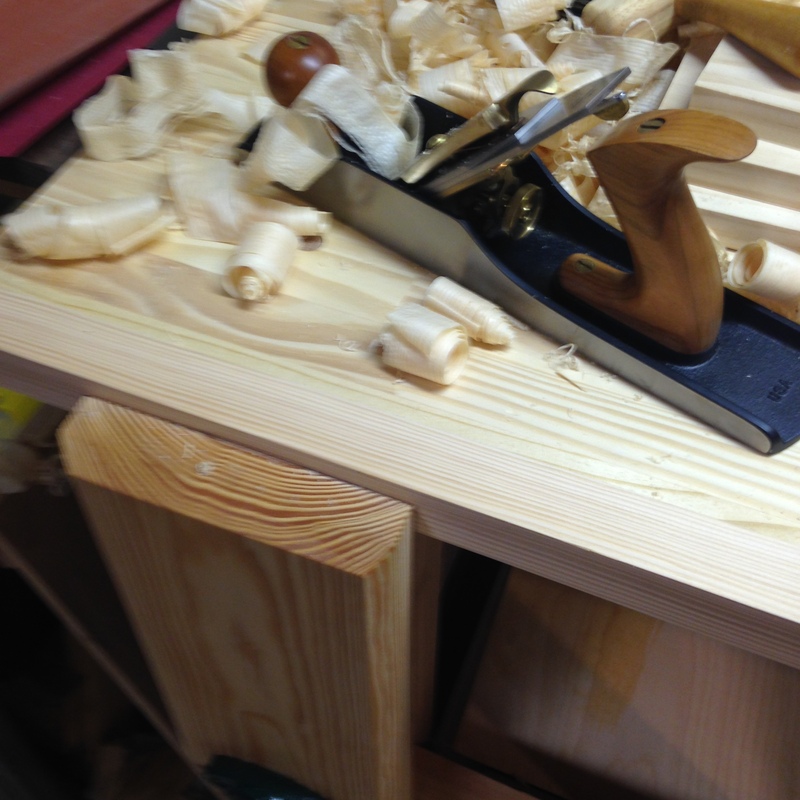 Strangely, maybe serendipitously, I saved a few of the cut-offs from the leg vise because the grain was so nice. Last night, as I was sharpening, I planed one of them lightly just for the hell of it, and liked what I saw. It then occurred to me that the leg vice chop was all the proof I needed. Looking at that chop, I could easily see that board used in a piece of furniture, more importantly, I could see an entire piece of furniture made from the same. Right now, the only thing holding me back is storage space. If I am going to make an attempt to build furniture from construction lumber, I’m not going to go about it piecemeal. I would go to the home center or lumber yard, pick out at least half a dozen or so boards, and saw and plane them to rough size for drying all at once. But I don’t have the space to allow that much lumber to dry, at least not if I want to woodwork in the meanwhile. So if I do this I’m hoping a member of the family with a lot more space than I comes through for me. After I finish my current project I may just give this a go, as I think this could be an interesting experiment. I know I’m hardly the first person to use construction lumber for furniture making. But I have never seen anybody attempt to make “fine furniture” using only two-by stock. I’m not trying to be a trend setter. Woodworking material is expensive, and seemingly getting more expensive by the minute. I once thought tools were the biggest expense in woodworking, but it seems that wood has easily surpassed that mark. So If I can figure out a way to cut a few corners yet not skimp on quality, then I’m going to attempt to make it happen in any way possible. Just the other day I was speaking to a customer of mine who is now retired. Since I’ve known him I’ve been aware that he is a high-level woodworker, though I was much more familiar with his turnings rather than his furniture/cabinetry. At this stage of his life he enjoys using the lathe, and his work primarily focuses on that aspect of woodworking. But when I was speaking to him he began to show me photos of some of the furniture he’s made over the past twenty years and all of it was spectacular. There were bookcases in many different styles, tables and chairs with intricate turnings, dressers and chests of drawers, reproduction pieces, clocks from pedestal to grandfather, as well as many other small pieces from serving trays to tool boxes. Though I wasn’t so surprised with the quality of his work, which I already knew to be excellent, I was surprised with the breadth. But above all, his wood selection stood out to me the most. Nearly all the pieces were made from Ash, Cherry, Maple, and White Oak, either singularly or a combination of the woods. These are all trees that grow locally which my friend harvested from his own property. While the quality of the work is second to none, the selection of high-quality woods is at least as important. My last project, and Enfield Cupboard, was made from Poplar, which is hardly on the wood species A-List. I planned on painting the cupboard from the beginning, so Poplar was an obvious choice. But after working with woods such as Walnut and Ash, I’m finding it more difficult to go back to using Poplar and Pine. It’s nothing new that working with high-quality wood makes your projects look nicer, nearly any woodworker will tell you that. 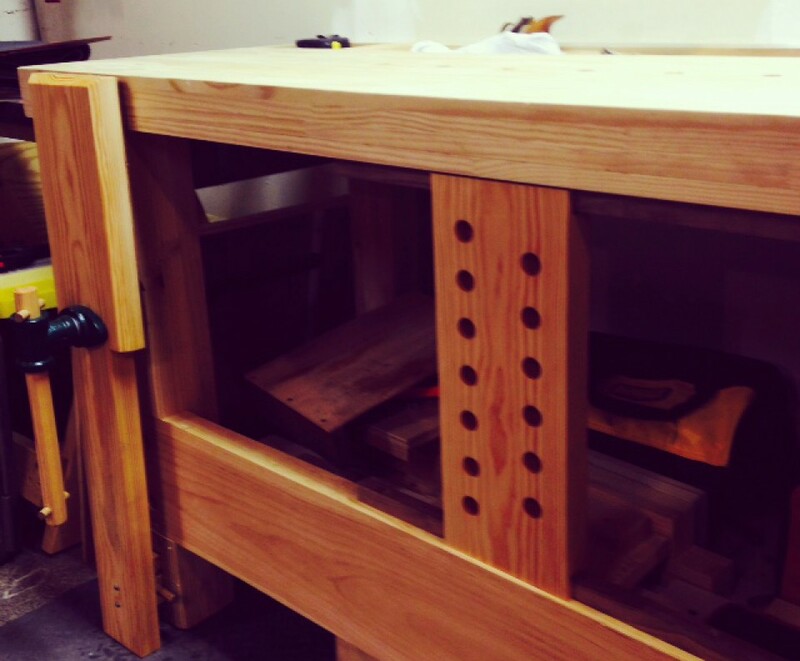 But I am finding that working with high-quality wood can also make you a better woodworker. Speaking for myself, these woods force me to think about things like highlighting grain patterns, and exposing joinery, and choosing finishes I otherwise wouldn’t use. In other words, these woods make me want to build furniture to the best of my ability. These woods make me want to try new things. Of course there is a problem with this new, old epiphany; these woods aren’t cheap. Walnut is my favorite species to work with; it’s a lot of woodworkers favorite species. It also happens to be one of the most expensive domestic hardwoods. 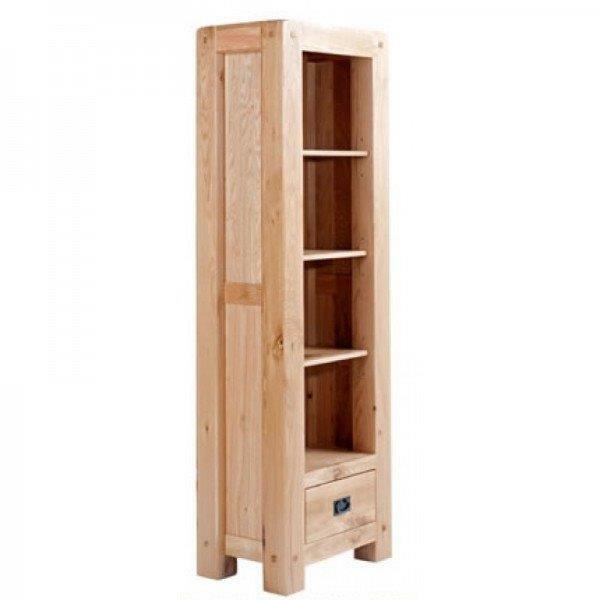 White Oak is a great wood for building furniture, once again it is priced on the high side. Cherry, you can’t go wrong with Cherry; unfortunately it is expensive, and can be difficult to find in wider boards. So you can see my dilemma. I may have said this before and if so I’m going to repeat it: I cannot go back to working low grade wood. I’ve tasted the Cognac, now I can’t go back to drinking Ripple. So when this long, miserable winter finally breaks, the first free Saturday morning I have will be spent making the drive to Hearne Hardwoods, and I will be returning home with a trunk full of Walnut, Oak, and maybe some Cherry, and for once I don’t care what it costs.